The prospect of losing a parent is hard enough, but when you’re a teenager and your mother has died giving birth to a brand new sister, the situation is doubly difficult. How to love the sibling that took your mum away from you forever and survived herself? This is the dilemma that sixteen-year-old Pearl faces when she loses her mother to birthing complications (pre-eclampsia and cerebral oedema). 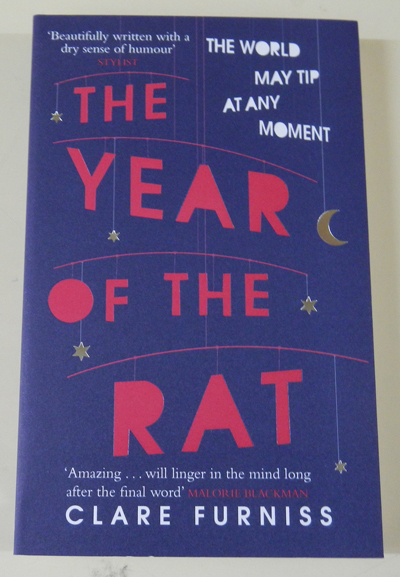 Initially excited at the idea of having a younger sister to adore and protect, Pearl is horrified when she learns that Rose- her new sister, ‘The Rat’ as she has named her- is the cause of her mother’s demise. Pearl struggles to deal with her grief, as well as all the new situations that have arisen since Rose’s birth, and vows never to forgive the baby. To make matters worse, she feels as though her dad Alex (who is not her paternal father although he helped raise Pearl from birth) is more focused on looking after his ‘real’ daughter, and this creates further feelings of resentment towards the baby. Everything in Pearl’s life has changed forever, and without her vivacious, carefree mother around to give her usual unwanted and misguided advice, Pearl doesn’t know how to cope. But then, whether it be through some sort of psychic awareness or just a delusional state of mind brought on by grief, Pearl’s mother appears in front of her- several times in fact. Pearl is able to talk to her, touch her red hair, smell her cigarettes. She is able to ask her questions about life after death, her real father James and her feelings about what has happened (although her mother manages to evade answering most of the important questions). Worried that people will think she is going crazy, Pearl decides not to tell anyone about her extraordinary, somewhat sporadic ability, but just knowing that she can still keep in contact with her deceased mother, even for a short time, provides her with some comfort. Meanwhile, everything else in Pearl’s life continues on. Her interfering Granny comes to stay and help out with the baby, and Pearl is both relieved and aggravated by the turn of events, especially knowing that her mother and Granny had never gotten along. Her best friend Molly starts dating a lovely new boy named Ravi, and Pearl, driven by jealousy tries to find fault with him. Molly is also dealing with family issues, but Pearl, unfeeling and still raw with grief, is unable to sympathise or show support. Pearl’s elderly neighbour Dulcie is ill and her handsome grandson Finn comes to help her out during the holidays before leaving for Music College. The pair get off to an unusual start, but there’s potential for things to get better. As well as all this, Pearl still has to complete her A-Levels at school and decide whether it’s worth continuing her education, when she has no real desire to do anything at all. Spurred by her feelings of neglect, she also considers finding her real father James, and begins to hunt for information about him when her mother refuses to tell her what she wants to know. With all of these subplots going on within the novel, you would think that this book would be quite confusing to read, but the author has managed to craft together an interesting yet challenging narrative. You can’t help but feel for Pearl as she goes through the most difficult moments of her life, but you also want to shake her and tell her not to be so selfish towards the other characters who are hurting just as much. Furniss is able to weave a strong story of grief with underlying moments of hope and love, and provide readers with a heartfelt and emotional journey that one teenager takes after the loss of a loved one. This book shows that despite intense grief, life still goes on, and although ‘the world may tip at any moment’, we have to tip with it if we want to overcome any difficulties that we face in our lives.